Rocla Grade Crossing Ties are the premier solution for concrete grade crossings. Grade crossings are an important part of rail infrastructure, enabling railroads to cross highways and provide the most efficient service through local towns and cities. Everyday motorists cross over the more than 40,000 grade crossings that exist throughout the North American rail network, which why it is critical that these structures are safe for cars and trains alike. Rocla Grade Crossing Ties are the foundation of a strong track structure, providing superior track surface alignment and gage holding performance, all of which are key factors in safe rail infrastructure. And like every Rocla concrete tie product, our Grade Crossing Ties are of absolute quality and consistency, which is why North American railroads trust us in the most safety critical conditions. Rocla 10' Grade Crossing Ties are designed for applications that require the use of Grade Crossing Panels. The 10' Grade Crossing Tie is commonly used at grade crossings on roadways, station applications for light rail, and is also used as a transition tie between wood and concrete track sections. 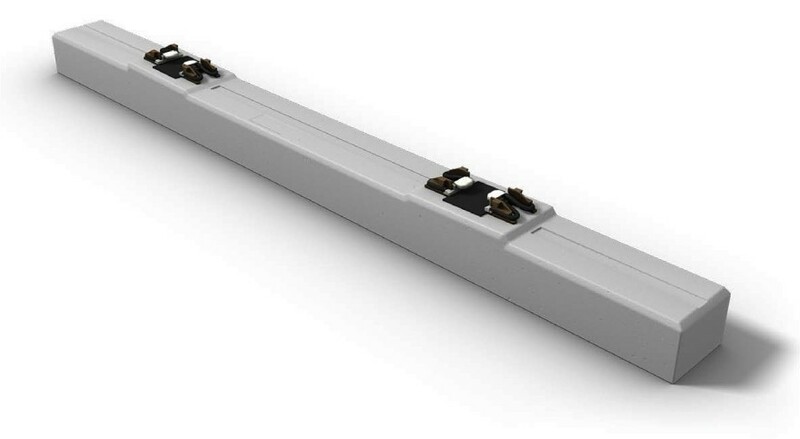 Fastening Systems: afastening systems featuring tension clamps (Skl) and screw-dowel combinations (Vossloh); screwless fastening systems featuring clips and anchor bolts.